Washington, D.C. – On October 8, President Obama signed a bipartisan bill supporting existing science, technology, engineering and math education programs at the National Science Foundation. The “STEM Education Act of 2015,” or H.R.1020, adds computer science to the umbrella of Science, Technology, Engineering, and Math (STEM) programs covered by the bill. The bill authorizes NSF to award grants to support research on effective ways to engage students in STEM and bolster STEM education outside the classroom in museums, science centers and afterschool programs. The act also emphasizes support for teaching STEM to K-12 students, their teachers and the general public. No new spending is authorized in the bill. 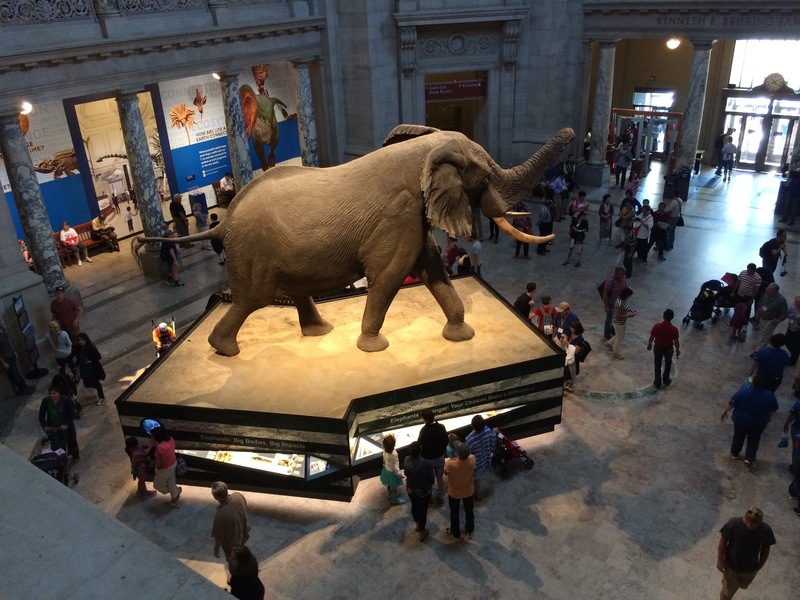 A view of the Kenneth E. Behring Family Rotunda at the Smithsonian Institution National Museum of Natural History in Washington, D.C. The new STEM education bill supports learning in informal settings, like museums. Credit: Elizabeth Goldbaum. Representative Lamar Smith (R-TX), the Science, Space and Technology Committee Chairman, and Representative Elizabeth Esty (D-CT) introduced the bill. The bill passed the House and Senate and was presented to the President on October 1. “A healthy STEM workforce that is literate in all STEM subjects, including computer science, is critical to America’s ability to create jobs and compete in the world,” Smith said in a statement. In addition to STEM education programs by the National Science Foundation (NSF), the bill also supports efforts by the Department of Energy, the National Aeronautics and Space Administration, the National Oceanic and Atmospheric Administration, the National Institute of Standards and Technology and the Environmental Protection Agency. Although less comprehensive, the act follows a similar vein to S.1177, the “Every Child Achieves Act,” which was proposed by the Senate as a successor to the “No Child Left Behind Act of 2001” and includes a new section focused on STEM education. The STEM Education Act of 2015 also amends H.R.1472, the “National Science Foundation Authorization Act of 2002,” to allow math and science teachers with Bachelor of Science degrees to apply for NSF Master Teaching Fellowships in addition to teachers with Master of Science degrees. The NSF Master Teaching Fellowship provides funds to support fellowships, academic programs and professional development for STEM professionals who enroll in a master’s degree program leading to a teacher certification. “More and more jobs of the 21st century require science, technology, engineering, and math skills. Final passage of the bipartisan STEM Education Act demonstrates that we can come together to help our children thrive and to help ensure that they can be competitive in a global economy,” Esty said in a statement. Very encouraging news and we certainly anticipate more available resources to provide quality STEM outreach to the K1-12 students to become STEM conscientious at an early age.It will ensure recruitment and retention of high school graduates thinking about STEM career.